The Charlotte Center Executive Board is made of of industry leaders in the greater Charlotte area. The board helps guide the Charlotte Center and provides many resources such as networking opportunities and guest lectures for current students, alumni and members of the community. Download a complete list of Executive Board Members. No. 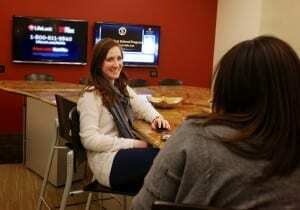 1 part-time MBA program in North Carolina and Top 20 in the U.S. (U.S. News and World Report). Bloomberg Businessweek ranked the MBA Program for Working Professionals #27 in the nation and #8 in the South. Wake Forest is also ranked among the world’s best graduate business schools by The Economist, Financial Times and Forbes. Ranked 31st in Forbes list of top U.S. business schools that measure students’ ROI. Wake Forest MBA graduates, on average, experience increased compensation that enables them to pay off their degree in only 3.6 years. The MBA for working professionals allows you to put your studies into immediate action, adding direct value to your organization and enhancing your career opportunities. The Center for Market Readiness & Employment provides lifelong career and life-planning strategies for MBA students and alumni. Personal career coaches are available whether you are advancing within your current company or interested in exploring options in our network of over 8,000 companies nationwide. Our team will work closely with you to assess career options, refine goals and sharpen interviewing and negotiation skills. Wake Forest offers curricula to fit any schedule. Attend class two nights a week or 37 Saturdays per year and receive your degree in only two years. Only steps from the heart of Charlotte’s bustling Uptown, the Charlotte Center features state-of-the art technology that keeps students on the leading edge of business education.